Region: Adirondack Reserve, 1/4 mile from Lake Champlain. 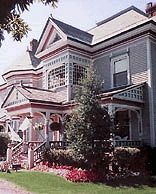 An 1886 Queen-Anne styled Victorian "painted lady" manor house situated on 5 ½ acres of park like grounds. The Inn features six distinctively decorated bed-chambers, all with private bathrooms featuring hotel amenities include silk bathrobes, floor slippers, shower massage units and hair-dryers. At day's end, we offer turn-down service with hazelnut truffles placed on our guest's pillows. Our complimentary gourmet breakfast is served in our Waverly appointed oak paneled dining room set to classical music with a crackling fire during the cooler months. After breakfast, guests may choose to lounge in front of a crackling fire in one of the Inn's romantic parlous, to relax on one of three porches, or to stroll our property complete with fountains and blooming gardens. Throughout the manor, a variety of floral wallpapers, antique furnishing and Victorian finery complement the Inn's beautifully crafted wood paneling and flooring. A truly unique, romantic and memorable "Victorian Experience!"